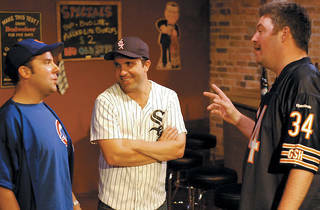 The Factory’s new comedy takes on the Cubs–Sox rivalry via age-old arguments. Just as the Civil War pitted brother against brother, an equally contentious north-south rivalry divides the family at the center of Nick Digilio and Anthony Tournis’s new comedy. 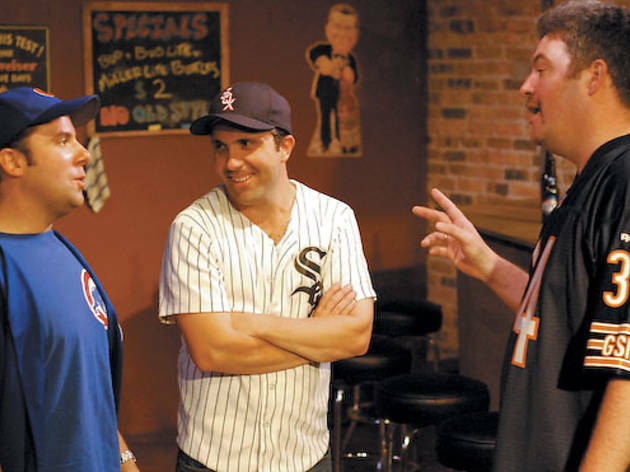 Brothers Jake (Tournis) and Tommy (Greg Caldwell) are lifelong, diehard fans of the Cubs and White Sox, respectively. When Major League Baseball institutes regular season interleague play in 1997, the boys make a bet that, after ten years, the brother whose team has racked up the most wins in the Crosstown Classic will merit a reward to be chosen by their lovably crusty father, Sonny (Brian Amidei, channeling Stacy Keach). And so, at various points over the next decade, we check in at Sonny’s North Side tavern, where Jake and Tommy watch the games along with a pair of wisecracking barflies and a steady stream of opinionated loudmouths, including a group of visiting New Yorkers who temporarily unite the sparring siblings in opposition to the loathsome Yankees. The playwrights indicate that they mean to convey the brothers’ maturation or lack thereof and to show how they redirect familial resentments into their sports rivalry. But character development takes a back seat to the play’s true purpose: to debate matters such as Ron Santo’s broadcasting skills and whether or not Old Style tastes like “cold Wisconsin piss” (blasphemy!). Some of these arguments are entertaining and some have been done to death (yeah, yeah, Wrigley Field is full of Chads and Trixies)—but the barrage of opinion ultimately overpowers the characters, and consequently late-inning attempts to tug at heartstrings feel perfunctory and unearned.